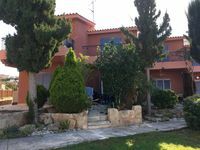 Property 2: Lovely family friendly house with just a short walk to the Paphos attractions. Property 12: Stunning 2 bedroom house in popular Tomb of the Kings area with shared pool. Rosetta Villa, Brand New Villa with private pool. Property 26: Rosetta Villa, Brand New Villa with private pool. Delightful Villa with Stunning Sea Views and Communal Pool. Free Broadband. Property 32: Delightful Villa with Stunning Sea Views and Communal Pool. Free Broadband. Property 34: Spacious 2 Bed House with amazing sea views, new aircon & wifi - Great location! Property 35: Modern 2 bedroomed Poolside Townhouse at Desire Gardens Peyia. Property 36: Well appointed 2 bedroom town house close to all amenities with internet. Sleeps 6. Free Wi-Fi. Roof terrace. Air-con. Walk to shops, bars & restaurants. Property 43: Sleeps 6. Free Wi-Fi. Roof terrace. Air-con. Walk to shops, bars & restaurants. Property 46: Best apartment in Paphos ★ 1 minute from beach ★ Renovated! Property 50: Sunrise 2 bedroom villa. We spent 11 nights in this beautiful property which is very good located. Near the beach, near the Lidl, near the bus stop. And all the time we enjoyed beautiful sea and mountain views. We are very thankful to our landlords Yuliana and Raymond. They took us to the store in the first evening. They provided us with tennis rackets and we could play tennis each day, court is free of charge in a complex. Property was very clean and we had everything we need. Thank you, Yuliana and Raymond!